I had never heard of Marketa Pichlerova before reading this book. And to be honest, if I didn’t look up the real history behind this book, I probably would have thought it too dramatic to be true. That’s why I think I loved this book so much. The basic story behind it is true. Marketa was real. The main parts of this story are things that actually happened. And man, is it a story. Marketa is a bathmaiden, which is basically saying she will be a classy prostitute. She longs to study and practice medicine, even though she is a woman and can’t have that dream. She works in her mother’s bathhouse and occasionally assists her father in his bloodletting procedures. I felt so much for her. Because her mother is a bathmaiden, that’s really all she can hope for in her future. She was born with the ultimate curse–being a woman. She just wants to do more than what is expected of her. She wants to follow her dreams and learn more of medicine and be able to practice. When she finally gets her first “patient” in the son of the king, I can see why her better judgment becomes clouded. She’s finally getting the chance to do what she wants, even if she doesn’t get the credit. She gets to use her knowledge of the human body to help someone, even if the man she is helping is too far gone to really feel any benefits. I feel bad for Don Julius, in a way. Granted, I don’t feel bad enough for me to find him redeeming in any way, but not everything is his fault. Yes, he is mad and insane, but those around him indulge him instead of really trying to help him. Fear of falling out of the king’s good graces leads Julius’ companions to turn a blind eye to his behavior instead of stopping it. It is in that way I feel bad for him. Who knows how things would have turned out had Julius been treated the way he deserved instead of being treated with kid gloves. The story itself is amazing. It reads like a soap opera, but is based in fact. That is what I find fascinating. Those few years the book described really happened. It’s hard to wrap my head around it and I really want to know more. 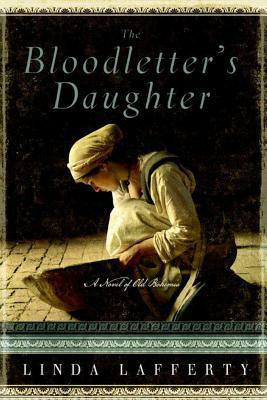 The Bloodletter’s Daughter is a fascinating read that transports you back in time and throws you right into the middle of the town. The story is brilliantly written and makes it nearly impossible to put the book down. This is a must-read book. This entry was posted in Historical Fiction, The Must Reads and tagged Historical Fiction, Linda Lafferty, Must-Reads.